Today's global financial markets are every bit as vicious psychologically, and sometimes even physically, as the battles the great warriors throughout history have faced. Just as the warriors of old rode out to battle with the confidence and knowledge to conquer new lands and foes, so do the warriors of the market who thrive on the battleground of the trading floor. 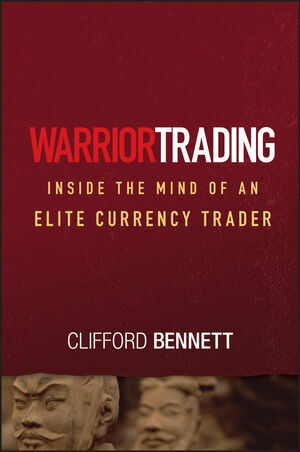 In Warrior Trading, Clifford Bennett, one of today's leading currency forecasters, outlines a path to trading success by highlighting the characteristics, the knowledge and skills, and the psychological state of mind required to be a true warrior trader. You'll be introduced to some fresh and unique perspectives regarding the markets, by looking at fundamental and technical analysis, as well as discovering how best to trade within the markets as an individual. Most importantly, you'll learn how to take advantage of those moments when the perceptions of most traders (the herd) are at odds with the underlying reality-moments when fear, greed, and other emotions wreak havoc on the ordinary trader's ability to operate objectively. Clifford Bennett is internationally respected as an insightful commentator and strategist on global economic trends and foreign exchange markets. He is the founder of FxMax (www.fxmax.com), a Web site that provides subscribers with recommended trades in the currency market. Prior to founding FxMax, Bennett was senior FX strategist (Asia) for a global investment bank based in Singapore. He is a highly sought after commentator, appearing regularly on international business television programs and speaking at international conferences.